Wladimir Klitschko has triumphed again in commanding fashion, an action which typically raises complaints that the long-time champ fights “bums” rather than “real” challenges. Of course, this raises an interesting question. Who are the bums and who are the real challenges? If Klitschko avoids a challenge, then name the challenge. And be careful with your answer. I remember little more than a two years ago when Klitcshko easily KO’d Tony Thompson in six. Critics immediately excoriated him for fighting a geriatric, rather than an unstoppable machine like David Price. Yet Thompson’s name is now mysteriously removed from the retrospective list of “bums” that Klitschko fought and – just as mysteriously – David Price is no longer a “real” challenge. Message board trolls and keyboard warriors claimed that Wlad was ducking Robert Helenius and Seth Mitchell as well – two more names now gone from discussion. He was also accused of “ducking” fighters like Sam Peter, David Haye and Alexander Povetkin – all of whom later fell to Klitschko with relative ease. Any more I’m forgetting here? Any other time when the critics never acknowledged they had crow to eat? This point is necessary in the aftermath of Klitschko’s sixteenth title blowout. Getting back to the point of the article here: Who else should Klitschko have fought? Critics will repeat the names with their eyes rolled: Kubrat Pulev, Tyson Fury, Chris Arreola, Tomasz Adamek, Bryant Jennings, Bermane Stiverne, Deontay Wilder, Dereck Chisora, etc. The above-mentioned fighters would challenge Klitschko with better odds than Leapai. But here’s the one thing his haters are loath to admit: Those odds would still be terrible. Klitschko will likely fight Pulev this year – I give him 4-1 odds. After that, expect a fight with the winner of the upcoming Fury-Chisora bout. With Fury’s fragile chin and sloppy technique, I give him far worse chance than Pulev. With Chisora’s overall dearth of championship skills, I give him a slightly worse chance than Fury. But I’m splitting hairs here. Even their biggest fans wouldn’t put money on them. One Klitschko passes those two tests, he’s on to total unification with the WBC champ – whoever that is by then. Another obstacle to fighting the more popular – perhaps even “real” – contenders emerges here when I discuss the WBC belt, and the fault is not Klitschko’s in the slightest. 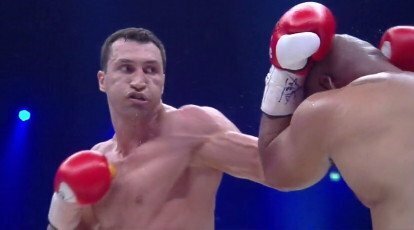 What incentive does a heavyweight have to fight Wlad, really? Sure, you get your shot at heavyweight glory. But you also get a bout no one has much chance of winning, and unlike a dream fight against Floyd Mayweather, this loss is a dead end. Few heavyweights can move to another weight class, and once they return to heavyweight title contention, all they have to look forward to is another crushing defeat to the champ who isn’t going anywhere. The smarter move is to avoid Klitschko as long as possible, go after belts he doesn’t hold, and milk your status as a contender to his throne for extra cash. It worked for Alexander Povetkin and David Haye. And it’s working for the WBC contenders. Look at how fierce competition grew for the WBC belt once the heavyweight division realized they could score a belt without fighting a Klitschko. First Stiverne and Arreola fight for the vacant belt. The winner must immediately fight Deontay Wilder. Assuming no rematches are necessary, THAT winner THEN fights the winner of the upcoming Jennings-Perez eliminator. And again – assuming no mandated rematches – that winner must face Tony Thompson somewhere down the line, probably in 2016 or so. There’s your “real” contenders there, folks – staying as far away from the universally recognized heavyweight champ as they can get. So what’s wrong with Klitschko’s stay-busy fights? Should he stay completely inactive on the off-chance that more popular fighters will finally step up? Alexander Povetkin pretended that he wanted Wlad from 2008 to 2013 while he milked the drawing power of being an unbeaten contender. Should Wlad have played Povetkin’s game? What about the “will they/won’t they?” shenanigans David Haye pulled around the same time? To hell with that. Wlad has money to make and records to break.